Making injection molded prototypes is both an art and a science. High levels of technical expertise and attention to detail are required to prevent small mistakes from costing companies big money when it comes to mass-production of novel parts. Most mistakes are caused by nescient personnel without the necessary experience or the right tools at their disposal. Conversely, creative solutions and ingenuity abound in personnel with the right experience and the correct combination of hardware and software. Finding the right team of people with relevant expertise is the most important part of the process. Description: Flow lines are streaks, patterns, or lines – commonly off-toned in color – that show up on the prototype part as a consequence of the physical path and cooling profile of the molten plastic as it flows into the injection mold tooling cavity. Injection molded plastic begins its journey through the part tooling via an entry section called a “gate.” It then flows through the tool cavity and cools (eventually hardening into a solid). Causes: Flow line defects are caused by the varying speed at which the molten plastic flows as it changes direction through the contours and bends inside the mold tool. They also occur when the plastic flows through sections with varying wall thickness, or when the injection speed is too low causing the plastic to solidify at different speeds. Increase injection speeds and pressure to the optimal level, which will ensure the cavities are filled properly (while not allowing the molten plastic time to start cooling in the wrong spot). The temperature of the molten plastic or the mold itself can also be elevated to ensure the plastic does not cool down sufficiently to cause the defect. Round corners and locations where the wall thickness changes to avoid sudden changes in direction and flow rate. Locate the gate at a spot in the tool cavity with thin walls. Description: Sink marks are small craters or depressions that develop in thicker areas of the injection molded prototype when shrinkage occurs in the inner portions of the finished product. The effect is somewhat similar to sinkholes in topography, but caused by shrinkage rather than erosion. 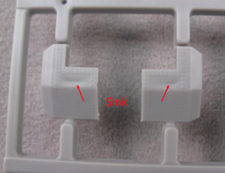 Causes: Sink marks are often caused when the cooling time or the cooling mechanism is insufficient for the plastic to fully cool and cure while in the mold. They can also be caused by inadequate pressure in the cavity, or by an excessive temperature at the gate. All else being equal, thick sections of the injection molded part take longer to cool than thin ones and so are more likely to be where sink marks are located. Mold temperatures should be lowered, holding pressure increased, and holding time prolonged to allow for more adequate cooling and curing. Reducing the thickness of the thickest wall sections will also ensure faster cooling and help reduce the likelihood of sink marks. 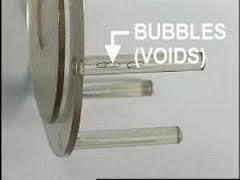 Description: Vacuum voids are pockets of air trapped within or close to the surface of an injection molded prototype. Causes: Vacuum voids are often caused by uneven solidification between the surface and the inner sections of the prototype. This can be aggravated when the holding pressure is insufficient to condense the molten plastic in the mold (and thereby force out air that would otherwise get trapped). Voids can also develop from a part that is cast from a mold with two halves that are not correctly aligned. Locate the gate at the thickest part of the molding. Switch to a less viscous plastic. This will ensure that less gas is trapped as air is able to escape more rapidly. Increase holding pressure as well as holding time. Ensure that mold parts are perfectly aligned. 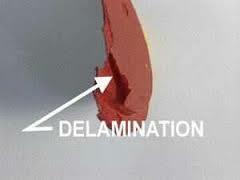 Description: Surface delamination is a condition where thin surface layers appear on the part due to a contaminant material. These layers appear like coatings and can usually be peeled off (i.e. “delaminate”). Causes: Foreign materials that find their way into the molten plastic separate from the finished product because the contaminant and the plastic cannot bond. The fact that they cannot bond not only has an affect on the appearance of the prototype, but also on its strength. The contaminant acts as a localized fault trapped within the plastic. An over-dependence on mold release agents can also cause delamination. Pre-dry the plastic properly before molding. Smooth out the corners and sharp turns in the mold design to avoid sudden changes in melt flow. Focus more on the ejection mechanism in the mold design to reduce or eliminate the dependence on mold release agents. Description: Weld lines are actually more like a plane than a line that appears in a part where molten plastics meet each other as they flow from two different parts of the mold. 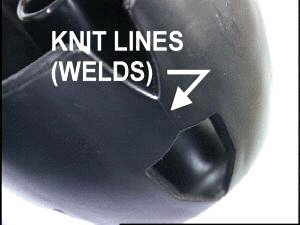 Causes: Weld lines are caused by the inadequate bonding of two or more flow fronts when there is partial solidification of the molten plastic. Raise the temperature of the mold or molten plastic. Adjust the design for the flow pattern to be a single source flow. 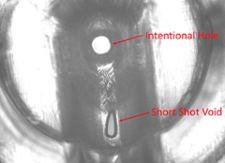 Description: As the term implies, short shots can be described as a situation where a molding shot falls short. This means that the molten plastic for some reason does not fully occupy the mold cavity or cavities, resulting in a portion where there is no plastic. The finished product becomes deficient because it is incomplete. Causes: Short shots can be caused by a number of things. Incorrect calibration of the shot or plasticizing capacities can result in the plastic material being inadequate to fill the cavities. If the plastic is too viscous, it may solidify before fully occupying all the cavities and result in a short shot. Inadequate degassing or gas venting techniques can also result in short shots because air is trapped and has no way to escape; plastic material cannot occupy the space that air or gas is already occupying. Select a less viscous plastic with higher flowability. This plastic will fill the hardest-to-reach cavities. Increase mold or melt temperature so as to increase flowability. Account for gas generation by designing the mold so that gas is not trapped within the mold and is properly vented. Increase the material feed in the molding machine or switch to a machine that has a higher material feed in the event that the maximum material feed has been reached. Description: Warping (or warpage) is the deformation that occurs when there is uneven shrinkage in the different parts of the molded component. The result is a twisted, uneven, or bent shape where one was not intended. Causes: Warping is usually caused by non-uniform cooling of the mold material. Different cooling rates in different parts of the mold cause the plastic to cool differently and thus create internal stresses. These stresses, when released, lead to warping. Ensure that the cooling time is sufficiently long and that it is slow enough to avoid the development of residual stresses being locked into the part. Design the mold with uniform wall thickness and so that the plastic flows in a single direction. Select plastic materials that are less likely to shrink and deform. Semi-crystalline materials are generally more prone to warping. Description: Burn marks are discolorations, usually rust colored, that appear on the surface of the injection molded prototypes. Causes: Burn marks are caused either by the degradation of the plastic material due to excessive heating or by injection speeds that are too fast. 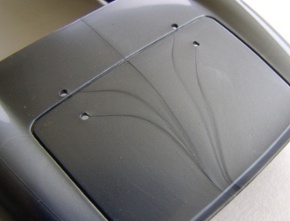 Burn marks can also be caused by the overheating of trapped air, which etches the surface of the molded part. Optimize gas venting and degassing. Reduce mold and melt temperatures. Description: Jetting refers to a situation where molten plastic fails to stick to the mold surface due to the speed of injection. Being fluid, the molten plastic solidifies in a state that shows the wavy folds of the jet stream on the surface of the injection molded part. Causes: Jetting occurs mostly when the melt temperature is too low and the viscosity of the molten plastic becomes too high, thereby increasing the resistance of its flow through the mold. When the plastic comes in contact with the mold walls, it is rapidly cooled and the viscosity is increased. The material that flows through behind that viscous plastic pushes the viscous plastic further, leaving scrape marks on the surface of the finished product. Increase mold and melt temperatures. Increase the size of the gate so that the injection speed becomes slower. Optimize gate design to ensure adequate contact between the molten plastic and the mold. Description: Flash is a molding defect that occurs when some molten plastic escapes from the mold cavity. Typical routes for escape are through the parting line or ejector pin locations. This extrusion cools and remains attached to the finished product. Causes: Flash can occur when the mold is not clamped together with enough force (a force strong enough to withstand the opposing forces generated by the molten plastic flowing through the mold), which allows the plastic to seep through. The use of molds that have exceeded their lifespan will be worn out and contribute to the possibility of flash. Additionally, excessive injection pressure may force the plastic out through the route of least resistance. Increase the clamp pressure to ensure that the mold parts remain shut during shots. Ensure that the mold is properly maintained and cleaned (or replaced when it has reached the end of its useful lifespan). Adopt optimal molding conditions like injection speed, injection pressure, mold temperature, and proper gas venting. A large number of the defects mentioned above can be prevented in the design process by incorporating proper tooling design into the iterative process.